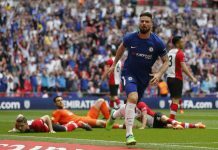 There were many moments which epitomised the gap between Chelsea and Arsenal during Saturdays game at Stamford Bridge but for me the one sticks in my mind happened in the first half and was perhaps something many would have missed. A dangerous cross was swung in took a deflection but Gary Cahill calmness personified calmly chests the ball back to Thibault. Tremendous defending and out of the corner of my eye I see Sanchez lift his shirt over his head in frustration. Change the teams round in that second sentence and this could describe our opponents yesterday. They were out thought out fought and outmuscled. We were simply too strong and wanted it more than them. This is not an article about their woes but watching some Arsenal players giving up and not chasing back was reminiscent of some our players at the beginning of last season. 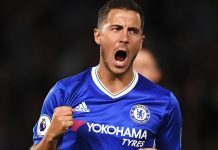 It is difficult to know where to start as there were so many amazing performances and moments none more magnificent that Eden’s goal. It was one of those “I was there” moments. Being the superb reader of the game I am , I had mentioned not moments earlier to my mate that Eden still looked like he was carrying a knock. Actually the only thing he was carrying was Coquelin on his back. The run and finish were magnificent and anyone lucky enough to have been there will know that we had witnessed a piece of pure footballing brilliance. The signing of Kante was a surprise but every time I see this guy play he never ceases to amaze me and I thank who ever managed to sign him. Yesterday there was something more to his ball winning skills in the absence of any genuine midfield quality in the opponents his distribution and ball skills came to the fore. The guy is unique in the modern games and the comparisons with Makele irrelevant. The effect of Kante’s work rate on Matic’s improvement this season are surely no coincidence. The latter’s distribution is also now a major part of his game and presumably those who wanted to drive him to the airport last season are glad they saved the petrol money. Yes, he like many, struggled last year but that did not make them bad players. Talking of which, for those who thought we should have kept Cech and got rid of Thibault, yesterday proved why the decision was made. That is in no way to denigrate the great Petr but merely highlight one was on the up and the other was inevitably on the way down. The club must do everything they can to keep him at the club. He made two world class saves yesterday and his general command of his box looks back to his best. A new coach and a new manager have done the trick. I mentioned Cahill above and he is getting better and better the partnership with Luiz reminiscent of his early days at the club next to John Terry. The difference being he is no longer the “junior “partner as much it appears in his own mind. The performances of Luiz continue to impress as does the whole of the back five. For mw however again Azpilicueta was simply outstanding. He appeared to have been given a second job of talking Ozil whenever he got the ball. He was terrier like in that job with ceaseless energy. In the final minutes of the game when Costa created some space running in at the far post was Cesar ready to assist but Diego didn’t use him. There was no complaint as he jogged back to the halfway line. Simply stunning, a team man. I was incredibly nervous before yesterday’s game. I perceived it was of massive importance in increasing the gap and taking out another rival. I had no need to worry, Antonio would not let our guys relax for a minute or underestimate the opponents. You have the feeling Conte is never likely to do that. He like Kante was not a bad summer signing!